AN interstate campaign beckons for talented three-year-old filly Lady Pluck following her effortless win in the $50,000 3YO Classic over 1200m in Launceston last night. Lady Pluck ($1.70) settled third while Gee Gee Queenie and Little River Boy jostled for the lead before Queen Bee eventually found the rail. The well-tried Maroch ($5.50) settled fourth outside of the favourite and they were both four lengths off the leader turning for home. But when rider Siggy Carr eased Lady Pluck to the outside and asked her to give, she quickly collared the leaders and went on to score by over three lengths from Gee Gee Secondover with Maroch a close-up third. 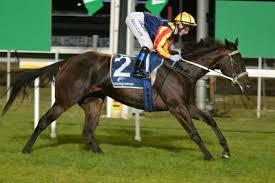 The Scott Brunton-trained filly is expected to head to Melbourne for a fillies’ race in three weeks. “I wanted to wait and see how she handled this race before making any firm plans but she did what I expected so we will progress with the plan to race her in Melbourne in three weeks,” Brunton said. Lady Pluck was coming off a first-up win in Hobart over 1100m in which she was a shade underdone but with that run under her belt, the filly packed too many guns for her rivals last night. “I needed to see her put them away like she did to warrant persevering with an interstate campaign and thankfully she delivered. It was the filly’s third win from five starts and Brunton is confident she will make her mark when she gets to Melbourne.